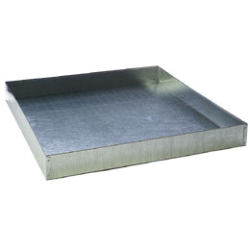 All purpose pan can be used for rabbit hutchews, pet homes, cat litter tray, or oil drip pan. Made from heavy-duty galvanized steel with riveted corners and hemmed edges. Pans pull out for easy cleaning. Fully assembled.